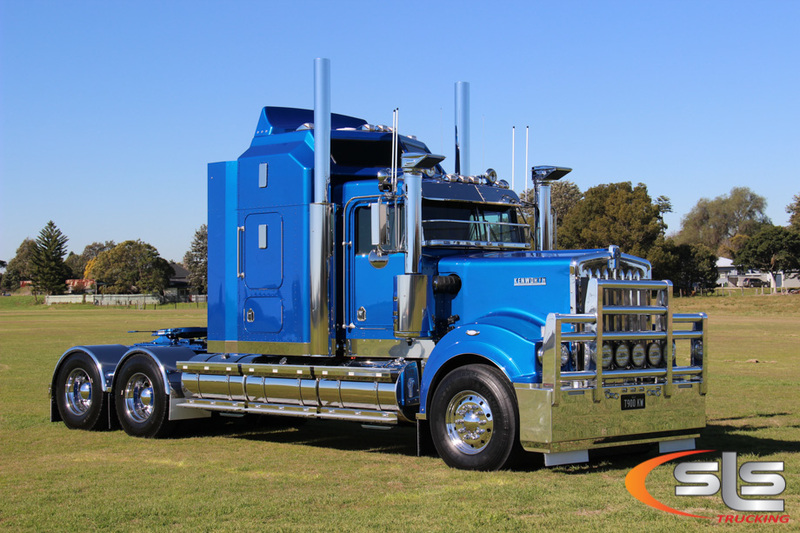 Last week we finished a massive fit out of Costello Transport’s Legend 900 #40. Damien was our very first customer back in 2003 and here we are 15 years later doing his third truck. Damien purchased the truck through Justin Brooks at Twin City Truck Centre. Congratulations to all involved, this is one sweet ride. Grill mesh, stainless grill bars, driving lights, convert blinkers to white, steer flares, quarter guard mudflap brackets, air cleaner covers, 7” riser pipes, air rams, mirror lights, spotter mirror brackets, stoneguard light trim, drop visor, roof lights, sleeper roof lights, cab trims, 7” Air Kooled exhaust stacks, smooth stainless exhaust shrouds, tank wraps, strap wraps, lighted and plain tank trims, bunk trims, wing trims, rear bunk trims with air/electrical, centremount mudguard brackets, stainless propeller deckplates, lowered rear bumper bar, rear infill panel with reverse lights, Icepack. In cab: 2 x 30L drawer fridges under bunk, upright fridge and storage drawers, microwave, TV/DVD player. I’m sure I have missed a few things!